These coconut joys are appropriately named and have definitely become source of happiness in our house lately. They are so easy to make and ridiculously delicious! Truth be told, I'm not sure if I should classify these as a no-bake cookie or a no-fuss candy, but we love them in either category. We made a batch of these simple treats over the weekend when a no-bake recipe for dessert was just what we needed. The kids and I almost always bake cookies, make pancakes or do something together in the kitchen on the weekends. So, by Sunday morning our collective sweet teeth were protesting because there was still no oven or stove plugged in to work with, but we still wanted our sugar fix, y'all. 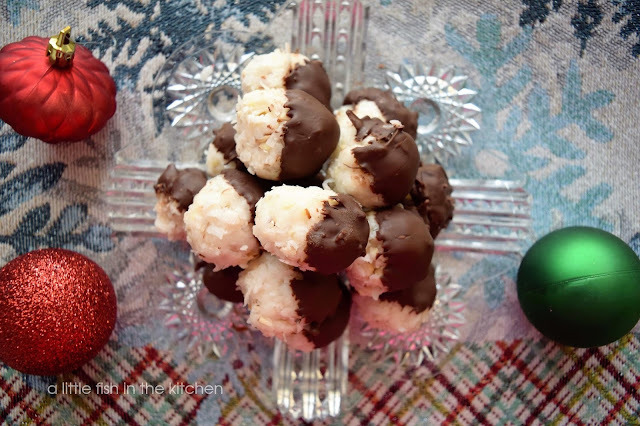 A good suggestion for a no-bake treat (preferably something dipped in chocolate!) was desperately needed. Once I remembered about these coconuts joys, I just knew it was the recipe for us that afternoon. Luckily, I had everything on-hand to make a single batch. Just about an hour after we started mixing ingredients, we had some pretty impressive yet straightforward little confections to help us take the edge off of a very boring afternoon. These little chocolate-dipped bites taste an awful lot like a certain popular candy bar...maybe you can guess which one? We just enjoyed the heck outta these little babies. The original recipe that I was given a few years back didn't call for it, but I like to add in some toasted, chopped almonds into the coconut mixture. 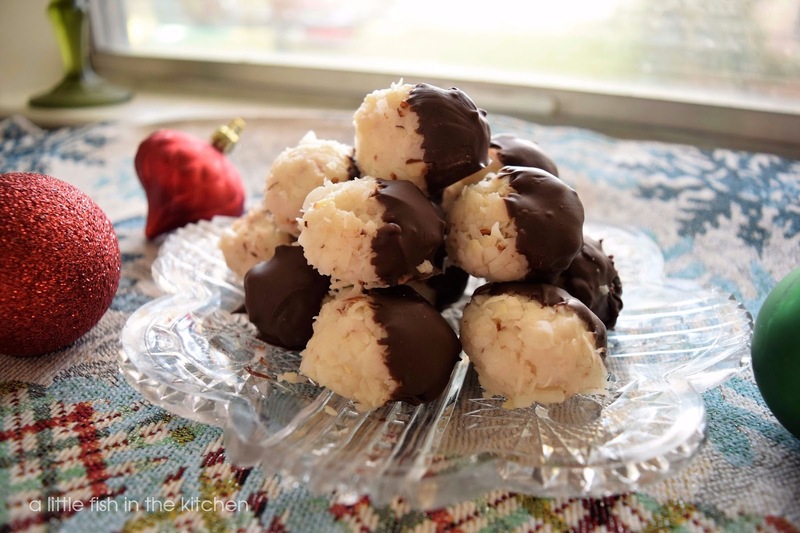 As a bonus, these coconut joys are gluten-free so even my friends and family with gluten sensitivity can indulge in a few of these goodies. Also, if you don't like almonds, feel free to substitute any other type of nut, like chopped pecans, to mix in with these. If you have nut allergies, of course, just omit the nuts entirely. I enjoyed these so much that I plan to pass out a bunch out as Christmas treats this year (so act surprised if you get some!). Plus, I think they'll be so festive when they're all dressed up with some colored sprinkles or sparkling sugar on top. Do let me know if you make some to share...or not to share, I won't judge. I promise. 1. Line a cookie sheet with parchment paper and set it aside. 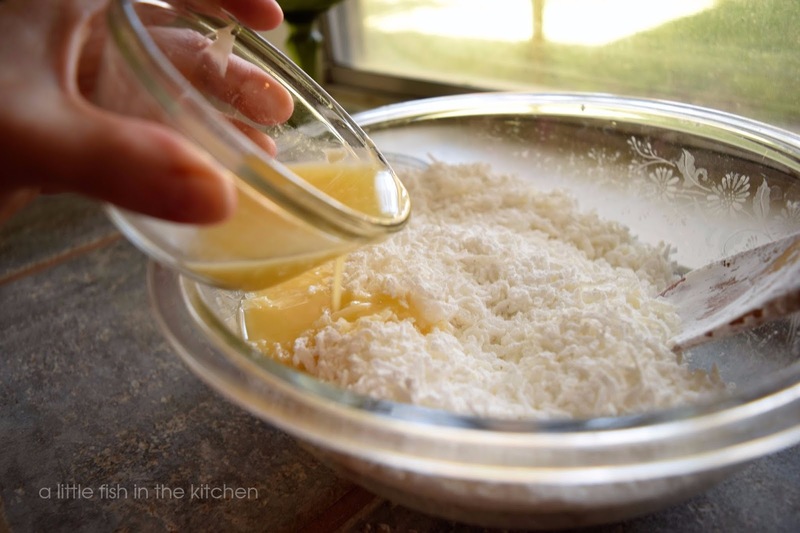 Combine shredded coconut and powdered sugar in a large mixing bowl. Pour in the melted butter and mix together until all ingredients are moistened (at some point you'll have to use your hands here to get it all mixed). Fold in the chopped almonds. 2. 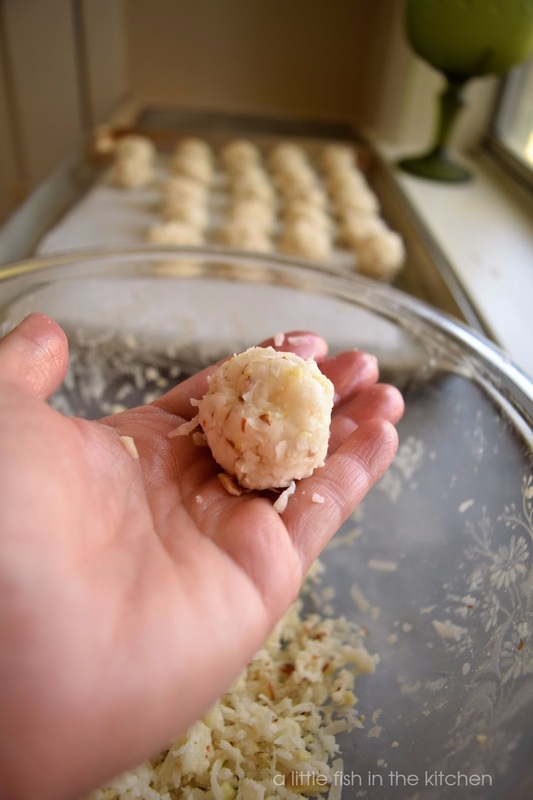 Roll teaspoonfuls of the coconut mixture into balls. (if the mix is too wet to stay together when you roll it, just add a little extra powdered sugar to help it hold better). Place them on the prepared cookie sheet. 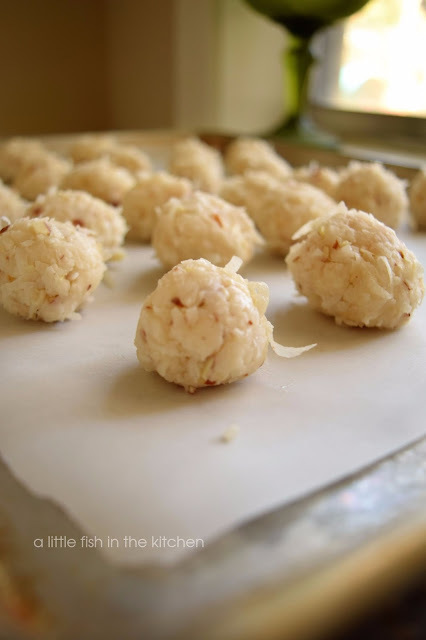 Chill the coconut balls for 30 minutes. 3. Use a microwave or a small sauce pan to melt the chocolate chips and shortening together until the mixture is a pourable, smooth consistency (it should pour off of a spoon back into the pan or bowl). 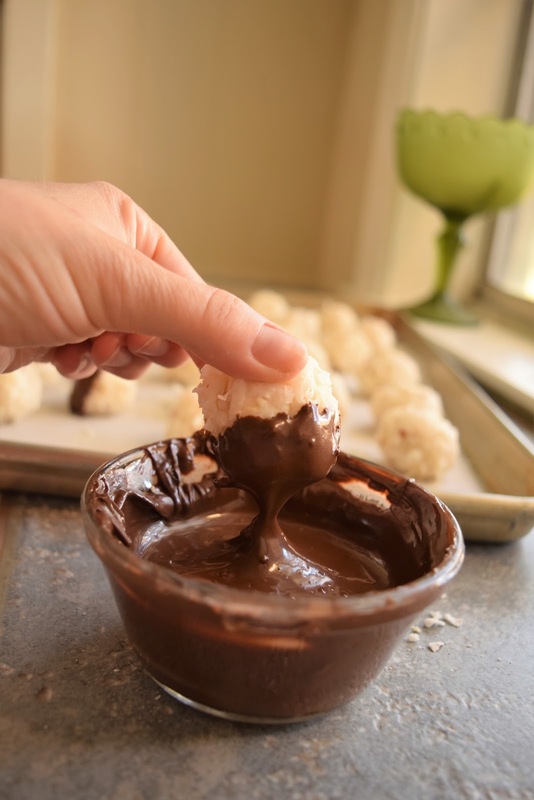 Dip one half of each coconut ball into the melted chocolate and place them back onto the parchment-lined baking sheet. Chill for another 20-30 minutes before serving. 4. Keep the coconut joys refrigerated for up to a week and enjoy! I will keep the entire batch to myself! They look heavenly. These look FABULOUS! I love that candy bar you're talking about so I know I'd love these too :). Hope you're loving your new floors! Hi Marcelle, love almond joys, bet these are amazing. Looks like you really know how to roll without an oven, good for you. I had to do that over the summer but my children are grown and gone, kiddos to you!! Marcelle, as a coconut fiend, these look amazing!!! And I'm going to be going through a 6 month home renovation and I'll be without a kitchen for months! It will be crazy trying to blog during that time. But I can make your no-bake cookies!!! The really taste just like a candy bar, David and they are wonderfully easy! Please let me know how you like them if you try them :) Thank you!! As a kid I did not like coconut but now I can't get enough of it. These are unique little cookies and I can't wait to give them a try. Love coconut! And I haven't had that candy bar in YEARS. And now, of course, you have me craving it. I'll just have to make these -- they look awesome! Thanks so much.